This is the official site for the tcpdump binary for Android devices. Precompiled and ready to go! Always the latest releases! If you want to compile your own? Go to our Compile Section for instructions. 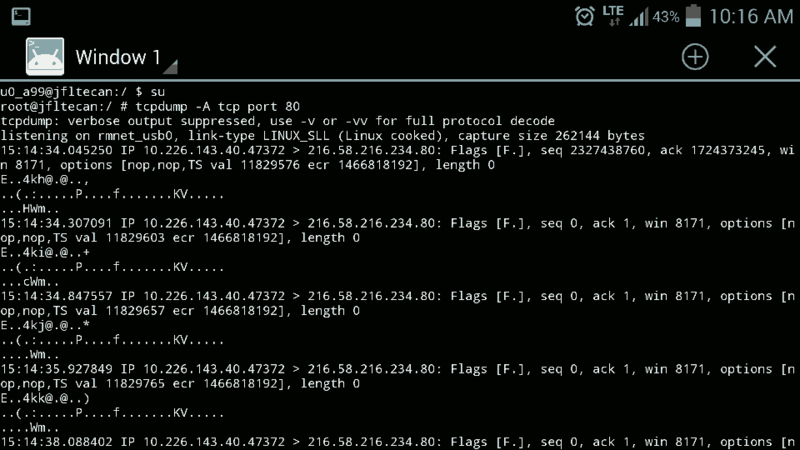 Android tcpdump is a command line packet capture utility. It can capture packets from your Wifi connection, Cellular connections, and any other network connections you may have. It has been compiled from the source code located at http://www.tcpdump.org. If you use linux's or unix's tcpdump application, then you will be familiar with Android tcpdump, because it has the same switches and options as its linux's counterpart. The compiled version is sometimes referred to as tcpdump-arm, because most Androids, more than 95%, run on the ARM architecture. The tcpdump binary, which is found in our Downloads section. Root access is a mod performed on the Android device to allow you to run applications at a superuser level. We will not go into the details on how to root your device on our site. There are many discussion groups / sites showing the how-to's to root your device. Needless to say, tcpdump needs to be run at a superuser level, so your device needs to be rooted. Note: Rooting your device could void its warranty. Since tcpdump is a command line tool, you will require terminal access on your device. There are plenty of terminal access programs for the Android. Just go to the Play Store on your device, and search for Terminal Emulator, or Shell Terminal, or Command Prompt, and this will bring you to a suitable shell prompt. Terminal access can also be from a tethered computer. If you have ADB (Android Debug Bridge), an option to connect is via the adb shell command, giving you access to a shell on your Android device from your PC. Don't forget to "su" to superuser before you run tcpdump, otherwise you will receive a warning, "tcpdump: can't execute: Permission denied"
This is what our site offers - tcpdump for Android. The binary, or executable is the command line tool you will be running. Once you have your device rooted, you should be able to copy the binary to a location of your choice. Once on your device, you can easily run it from either your Downloads directory, however most people either copy it to the /system/bin or the /system/xbin directories. That is only a recommendation, because these directories are already in the path. Go to our Downloads section to download the latest and greatest precompiled Android tcpdump binary.